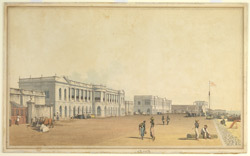 Water-colour drawing of the Board of Trade and Customs House at Chennai (Madras) by John Gantz (1772-1853) in 1824. Inscribed on the front in ink is: 'John Gantz. 1824'; and on the back in pencil: 'S.E. view of the Custom House & Board of Trade Madras'; also in ink: 'J. Strachan Esq.' John Gantz produced standard topographical drawings for sale to Europeans in Madras, making in some cases several versions of the same subject. In the 19th century Madras was one of India’s major ports and handled high volumes of import and export trade with Britain and other parts of the world. The Custom House stood on the harbour foreshore at George Town and was one of a number of handsome colonial buildings built in the early 19th century. A flagstaff is mounted in front and boats used to transport passengers and cargo to shore are drawn up on the beach on the right of the picture.